The Sydney CBD area is finally getting some much needed attention in terms of small concept bars. Stitch Bar only opened about two months ago. Located on York Street near Wynyard, this little bar is hard to find. We almost walked by it, but thankfully there was a bouncer outside, crunching down on an apple, who asked us, 'Looking for Stitch, girls?' If you're unlucky enough not to be greeted by the apple-eating bouncer, look out for the big number 61 above the door or Cupcakes on Pitt (which is right next door). Stich pretty much transports you to Melbourne. I've been to so many small bars in Sydney, but this one really emulates the Melbournian standard of small bars. It even reminds me a little bit of Seamstress, a Melbournian bar that has hanging cheongsams (Chinese dresses) from the ceiling. There isn't that Chinese influence, but it sure looks like a tailor's shop. 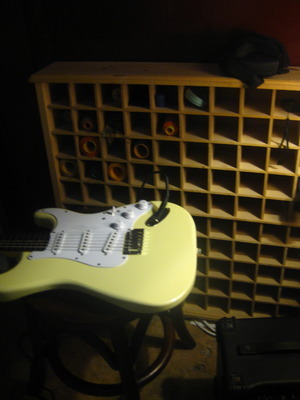 Before you descend the stairs, you'll find a little nook that has thread, sewing machines, half-sewn clothes, and an electric guitar (kind of random, we think at first - but later upon leaving the bar we find a guy actually playing the guitar). Once you've gone down the large (too large even) staircase, you'll find a cosy and well thought out bar. There's a wooden feel and a warm, dim atmosphere. The floor is painted red with footprints and handprints randomly scattered throughout. The actual bar has a rows of sewing machines underneath it. They're also lit up - nice touch. We're seated at a small cabinet, which doubles as a table. I like this idea, until I realise that it can get quite annoying because you can't put your legs underneath it. We spend around three hours here, so the slanted legs and the hard stool make me feel a little numb. We've heard that the hot dogs are their specialty, so we peruse the menu and get three different hot dogs. I have the Bulldog ($17), which is the spicy Mexican-inspired dish (black eyed peas, spicy tomato salsa, avocado and jalapenos). We also order the French Poodle ($17): Toulouse style sausage, red wine and garlic with Tarago River Gippsland brie, pickled pear and dijon mustard. Lastly, the indulgent foie gras and truffle sauce hot dog is called Mack Ducky Dog ($19). All the hot dogs are served with homemade curly fries, which I'm immediately drawn to. Unfortunately, the curly fries are a bit limp - they're cut too small in my opinion. But the taste is very, very good. All in all, the hot dogs are filling and tasty. The only problem was that they didn't arrive at our table for a good 45 minutes. The first cocktail I try is the Strawberry Swing ($19), which I definitely recommend. Instead of being like a strawberry daiquiri or margarita, this cocktail is much more subtle. It has a very interesting flavour because it only has a slight strawberry taste and it isn't sweet like you'd be expecting. The cocktail comprises strawberries and basil leaves gently bruised, shaken with 42 below vodka and topped up with Chandon sparkling wine. I'm a fan. I also try the High And Dry for $19 (apple eau de vie Calvados blended with Krupnik honey liqueur, mixed with fresh apple juice, lime juice then sweetened with homemade Rosemary syrup). I really like the fresh taste of this cocktail; the only downside is that there are bits (of either rosemary of apple) in the drink. I think it would have been more enjoyable if it had been strained. That's me being picky though. 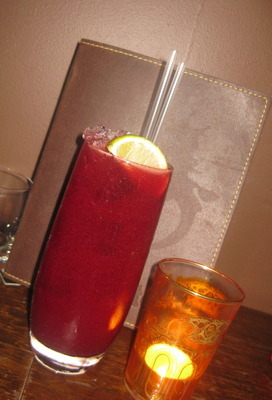 Another drink we try is the Beetlejuice, which you should only order if you like beetroot and ginger. I'm impressed by the pretty beetroot colour. And if you're a fan of pineapples, definitely give the Pineapple Head ($19) a go. After the hot dogs and two rounds of cocktails, we try one of the desserts: the ice cream sandwich ($6). There was only one flavour left: espresso lace. I cannot stress enough how good this ice cream sandwich is. It has a delicious coffee taste without being overpowering. And there's also fairy floss as a garnish. Six bucks well spent. You're likely to burn a lot of money at this bar, but I'm happy to do so. Stitch is open from 4pm till late from Monday to Saturday. See the website for the full menu. Why? Cocktails, hot dogs, and curly fries!